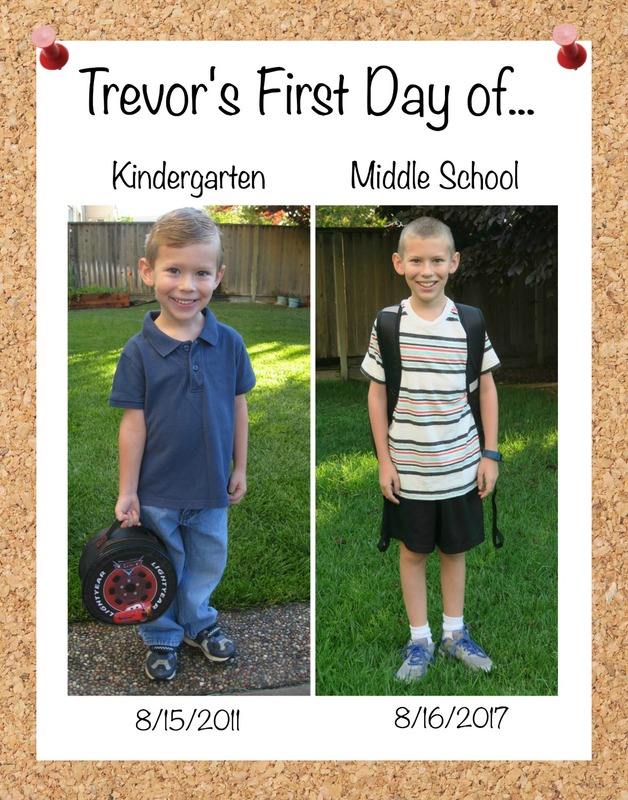 Trevor started middle school yesterday. After six years at his elementary school, it was a big transition for my boy who is not a big fan of change. I'm happy to report that he absolutely loved it and is really excited for the year! Look at little 5-year old Trevor! So cute with his nicely combed hair, navy polo, and Lightning McQueen lunchbox. He's still cute, of course, but he's so grown up now. So how did I make this? PicMonkey. Literally all I did was collage the two photos, open a blank canvas, add the corkboard background, place a white rectangle on top, insert the photos, add the text, resize the title, and then add the pushpin overlays. If you've never tried PicMonkey, I highly recommend you check it out. If you've tried it but it's been awhile, you might want to give it another go. They're adding new features all the time. I use PicMonkey practically every day and can't imagine my creative life without it. So cute! I'm glad he had a great first day! Such fun to see the comparison! I love Picmonkey! Wow!! I am LOVING this and loving that you made it with PicMonkey!!! Very cool!!!! And look how much he has grown!!!!!!!!!! I love those photos!!!!!!!!!!!!!!!! Oh my, look at little and grown up Trevor, side-by-side! Great layout, Cindy; love the corkboard BG! Awwww.....still cute now. Nicely scrapbooked!